This guest posting from KPMG looks at the evolving Chinese tax environment for multinational enterprise (MNE) management of IP tax issues. KPMG China has prepared a detailed overview of these issues, alongside setting out how KPMG China tax service lines may assist. Read more here. KPMG also actively participated in the recent programs PTO conducted on licensing IP issues in China by providing a background to the changing tax environment. The first such program is described here. Recent years have seen far-reaching changes to the Chinese tax law and administrative treatment of foreign MNEs operating in China. Most notably in the field of transfer pricing (TP) but also in other areas of tax law, the Chinese tax authorities have progressively taken a far more assertive approach to taxing MNEs. Underlying this is a perception amongst the tax authorities that insufficient Chinese tax is being imposed, as the authorities consider that underappreciated value is being generated by MNEs’ Chinese operations, driven by special attributes of the Chinese business environment. This has occurred against a backdrop of the G20/OECD Base Erosion and Profit Shifting (BEPS) global tax reform initiative, which commenced in summer 2013, and which is directed, in broadly the same manner as the Chinese tax authorities’ initiatives, at ensuring the alignment of taxation with the locations of economic activity and value creation. The BEPS project is being leveraged by the Chinese tax authorities to bolster and support their own efforts. In tandem with the planned finalization of the two-year BEPS project work in October 2015, the Chinese tax authorities are set to release their own guidance in the near future, which will have significant implications for MNEs. These trends and developments are having, and will continue to have, an outsized impact on the arrangements under which MNEs manage how their Intellectual Property (IP) is used in relation to their Chinese operations. IP taxation has long constituted one of the most challenging areas of China tax management and planning, with a plethora of tax issues arising in relation to the conduct of IP development in China, the licensing of technology cross-border into China, and the co-ordination of MNE global IP portfolios through IP management hubs. The rapid development of the Chinese economy and its relationship to the global economy has, by changing the ways in which MNEs deploy their IP in China, been adding to this tax complexity. In this regard, the steady increase in the sophistication of China’s economy has been matched by a move away from low cost production in China. There has been a move towards the seizing, by China, of the higher value-added, innovative stages of activity within MNE global value chains for production of high technology products. In parallel, the rapid expansion of the Chinese market has led to a substantial ramp up, by MNEs, of their marketing and promotion activities in China, alongside the customization of products and brands to meet the needs of the Chinese customer base. These fundamental business conduct changes have led the Chinese tax authorities to take the position that historic approaches to taxing MNE activity in China are now invalidated, and this is compounding the already significant pre-existing challenges of China IP tax management. This being said, MNEs need to be aware of the challenges involved in obtaining Chinese innovation tax incentives. The HNTE incentive requirements in particular can be quite challenging given the ambiguity concerning when an applicant might be viewed as owning ‘core IP’ and there can also be difficulties in maintaining the R&D expenditure-to-turnover ratio when enterprise sales are increasing. Furthermore, the variability across China in the application of the qualification criteria by local tax authorities, and the heightened tax audit scrutiny of HNTE applied by tax authorities in recent times, also need to be factored into planning. The seizing, by China, of the higher value-added, innovative stages of activity within MNE global value chains for production of high technology products happens at a time when China’s domestic market for technology transfer is becoming both more active and more formalized, as Chinese enterprises become vectors of innovation. Technology transfer, and the licensing arrangements that enable it, are increasing between domestic firms, outwards from China to foreign enterprises, as well as inwards from MNEs to their China subsidiaries and China third parties. For foreign MNEs this means that the existing flow of foreign technology, foreign know-how, and foreign expert services into China (much of it being inputs into Chinese high-tech exports) is set to steadily expand. 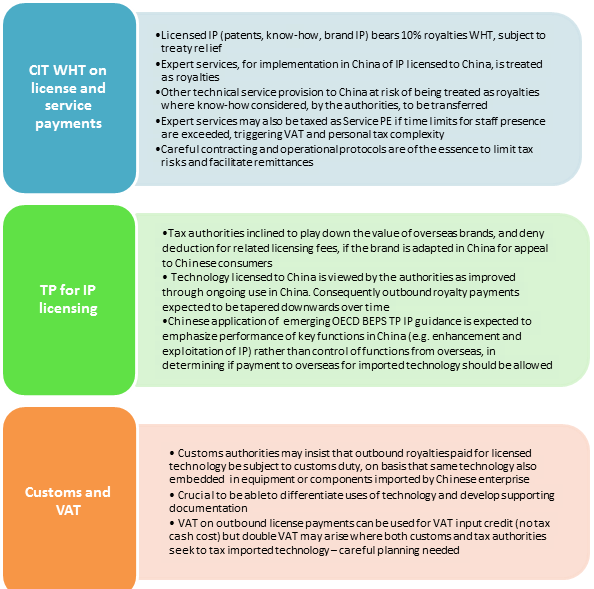 This will further increase the need to be aware of and manage effectively the related ‘tax friction’ on the licensing of technology into China and related service fee payments, including CIT withholding tax (WHT) and TP issues, as well as Customs Duty and VAT issues. Use of IP management hubs, conforming to the new BEPS requirements, for China IP management should still be possible in future, but much greater preparation and planning may be necessary than was the case in the past. Obviously, for company-specific tax advice, please consult tax professionals such as KPMG. This article prepared by Conrad Turley at KPMG. Thanks again to KPMG for this guest posting! This entry was posted in China IPR, KPMG, Licensing, Tax, Transfer Pricing.